A hiking umbrella may not be for everyone but it has certainly earned its place in my pack over the course of several long thru-hikes. The Swing Trek Liteflex is a multi-use piece of gear and has contributed greatly to my enjoyment of the outdoors. I recommend this particular umbrella for anyone seeking a durable, lightweight, and easily-deployed shelter from the sun, rain, hail, and wind. You’ll likely find that it has many other uses, too. 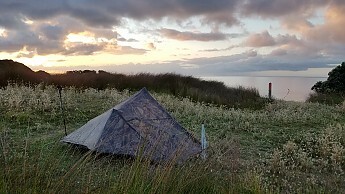 Conditions: The excellent review by JRinGeorgia pretty much covers everything there is to say about the Swing Trek Liteflex umbrella, but I will try to add a few more insights, given my extensive use of it. The Liteflex has now been with me on the Florida Trail, Colorado Trail, Appalachian Trail (first 270 miles), New Zealand’s Te Araroa, and will again be my companion on a thru hike of the Pacific Crest Trail summer, 2018. It has seen a lot of use and a lot of different conditions. Perhaps more remarkable that I haven’t lost it by now, it is still fully functional. The Euroschirm Swing Trek Liteflex is one iteration of a line of essentially identical products sold (and sometimes rebranded) by Zpacks, Gossamer Gear, and Six Moon Designs. The original design gained traction and a loyal following as the Golite Chrome Dome (which is no longer in production). I took advantage of my Prime membership and ordered it from Amazon. At around $50, this is an expensive umbrella. But when you consider the lifespan and functionally, it’s worth it. As a Floridian and therefore frequent user of cheap umbrellas, I’ve known them to break on their first use…you get what you pay for. With the Liteflex, you get something that is very lightweight, made of quality materials that will never rust, and will last through thousands of trail miles. It can actually save you money by not having to buy a really expensive rain jacket, pack cover, etc. The only thing that greatly decreases its economy is losing it prematurely…so I wrote my name on mine, first thing. It comes with a case, which is now yet another useless thing in my closet. 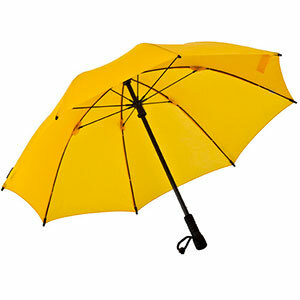 It would help to protect the umbrella when not in use but for me, it is not worth the weight and fuss of carrying it. My umbrella weighs 8.3 oz, and that includes the modification I made to the wrist strap. I cut and wrestled apart the original strap (it’s glued into the handle) and replaced it with a 10" long piece of shock cord, with a small cord lock at one end and micro carabiner at the other end. More about this later. The shaft and ribs are made of fiberglass and it has an EVA foam handle. The canopy is made of polyester fabric with a reflective silver, Teflon coating. The underside is black, which is important in making it appeasing on the eyes when it is above your head all day. Telescoping or not? 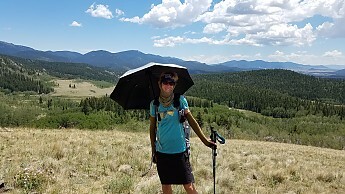 There are a few other trekking umbrellas (Montbell and Snow Peak) on the market that weigh a few ounces less and also telescope to fold more compactly. The major downside of these umbrellas is that you have to fold and unfold each individual rib manually (they have little hinges). When I reflect on how many times I’ve opened and closed my umbrella, this seems extremely tedious to me. I would rather have an umbrella that takes just one simple action to set up and break down than to save a few ounces…and believe me, with a baseweight of around 12lbs, I am pretty weight conscious. Also, the more complicated something is, the more points there are that can fail. 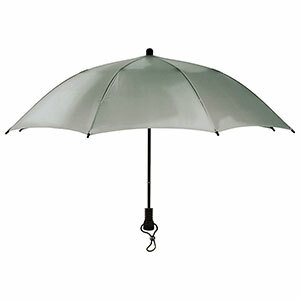 Lastly, these compact umbrellas offer less surface area than the Liteflex, therefore, less protection. The length of the Liteflex has not been much of a problem for me. I have been able to take it in conjunction with my carry-on items on airplanes and it fits reasonably well in the side pocket of my pack. Since I have such a low-volume pack, it does stick up as the highest point. There were a few days in New Zealand where the trails were so overgrown that I had affix it using just the side compression straps, pushing it below the plane of the top of my pack. I have even carried it wedged between my hips and hip belt, like a sword. But unless you spend all your time bushwhacking, conditions this bad are rare. I actually like that the umbrella sticks up above my pack because it makes it easy to reach back and grab without taking my pack off. It also gives me a visual cue that it’s still there, even though it has never accidentally fallen out. The length also comes in handy as a side-wall prop for my tent. Rain protection: The ability of an umbrella to keep the rain off is pretty obvious, but there is actually a lot to consider here. Perhaps most importantly, an umbrella keeps my core (head and torso) dry and that is what results in me being able to hike comfortably all day in the rain. I emphasize my core, because even an umbrella can’t keep you totally dry. In a heavy enough rain, my arms and lower half will get pretty wet. 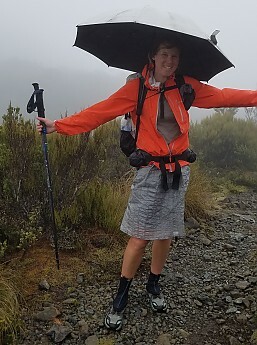 My Zpacks DCF rain skirt helps but I’ve experienced one occasion where the rain running off the bottom of my pack even soaked through the zipper in the back! The truth is, most rain jackets, pants, and skirts eventually wet-out. Even if they don’t, just having cold water sitting on the outside of the material (or sweat from the inside) is enough to cool me down. I have been in some very bad conditions where hypothermia might have been an issue, were it not for my core staying dry. So if it is an option, I will always use my umbrella as opposed to a rain jacket. 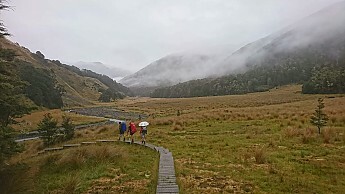 Walking down from Ball Pass, Mt Cook National park, in the rain. That's a glacier to the right. An umbrella is good in all temperatures in the rain. If it’s hot or I’m going uphill, I can leave my rain jacket off entirely. If it’s cold enough to warrant a jacket, I can at least leave the hood off and the zipper open. An umbrella also keeps my pack dry, to an extent. The rain rolls off onto the bottom back of my pack…not a problem since it’s water-resistant DCF. Because of this, I don’t use a pack cover. 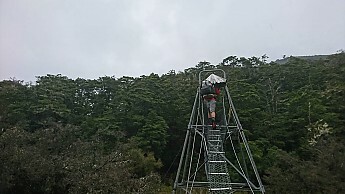 Using my customized attachment system, my umbrella is much faster to deploy and take down than having to take my pack off, remove rain gear, put it on, only to have to go through all those steps again in reverse when the rain stops 5 minutes later. Likewise, an umbrella is a much quicker and easier way of staying dry when you have to go for a short mid-night potty-break in the rain. 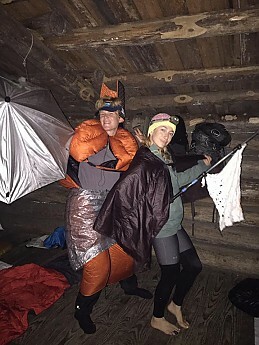 Think how cumbersome it is to have to don and take-off rain gear in the dark, bringing all that wetness back into the tent. An umbrella can actually shave weight from your pack by enabling you to leave the rain gear at home. 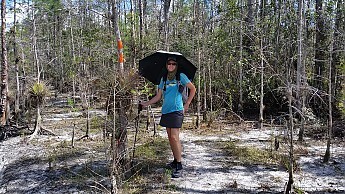 When hiking in warm Florida, I no longer take a rain jacket. An umbrella creates a rain-free bubble to consult a map, play with a cell phone, take a picture, remove or replace stuff in my pack, and eat a snack. I’m sure there are many more activities I’m forgetting. Protection from the Sun: As much as I like my umbrella in the rain, I have actually used it a lot more for sun protection and temperature control. For starters, I have very fair skin and am at risk of skin cancer…a factor very much at odds with my love of being outdoors. 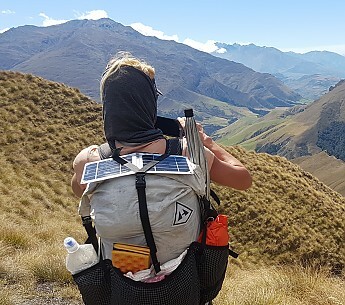 In New Zealand (where there is an ozone hole) and at elevation, it’s especially important to avoid the more intense UV rays. I hate wearing sunscreen and sometimes it’s too hot to cover up, so an umbrella is a great way to keep the sun off the sensitive areas of my head and face. The umbrella is rated SPF 50+. The Liteflex umbrella also lowers the temperature underneath it a good 5-10 F°, making an otherwise insufferably hot day, bearable. Presumably, the silver canopy makes a difference here, but I haven’t tried non-reflective umbrellas to be able to prove a difference. Still, I think it helps. 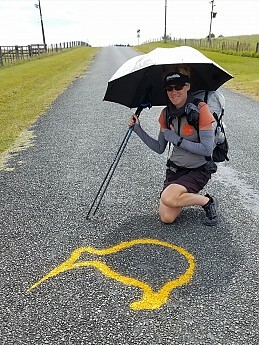 I’ve walked with my umbrella deployed for hundreds of miles on beaches and roads in New Zealand, pretty sure at some points that I might have died without it. 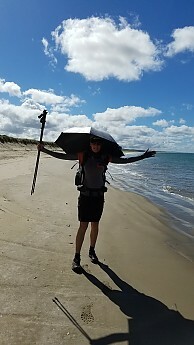 In fact, the first 100 kms of Te Araroa are all beach, with almost no shade that entire length. And imagine a hot summer day walking on asphalt for miles. There were times when the bitumen (tar-seal) was melting and getting stuck to the bottoms of my shoes. But because I didn’t have to worry about sunburn, I could take off my hat and buff and just let the breeze blow through my hair, further improving my comfort. Construction and Durability: I always considered an umbrella to be rather a throw-away kind of item. Use it a few times, a puff of wind turns it inside out, rendering it useless, go buy another one for $5. Based on such experiences, I was dubious of the Liteflex’s ability to withstand the rigors of the trail but it has proved to be amazingly strong and durable. After riding thousands of miles on the back of my pack, either deployed or folded, it is still 100% functional. It has suffered only 1 small puncture (fixed with tape and silicone) and a lot scuffing to the silver coating. It has been through gusty thunderstorms and hail. It has blown inside-out a few times times, always popping back into place. It has scraped against the nastiest, thorniest plants the trail could throw at it. It has been bashed into tree branches. It has gotten snagged while I tried to crawl under and over countless downfall. It has been in damaging UV light for months on end. Still going strong. Now that I know how bomb-proof it is, I love when others (who have never even hiked a mile with a trail umbrella) try to convince me otherwise. Kiwis especially scoffed at the notion of using an umbrella in New Zealand. I was told repeatedly that the trails were too overgrown and the winds too strong. Yet, in walking the length of the country, I only encountered one occasion where I couldn’t use it. This was while walking along a road during tropical cyclone Fehi…the sideways rain rendered even my rain jacket useless. Excluding named storms, in all the other situations where I needed it, the Liteflex worked just fine. Even on the incredibly overgrown trails (which make the Appalachian Trail seem like a wide-open cathedral), I was able to make it work. I’ve often had to collapse the umbrella to slide by an obstruction (for instance, the swing bridge in the picture below). The one-piece shaft makes this quick and easy, without having to remove it from my pack clips. Slide it down, pop it back up, easy! I have attached two clips to my pack’s shoulder strap using small zip ties. These were once tent pole clips, which I removed from a cheap, abandoned tent. I saved them for no apparent reason, only to discover years later that they fit the diameter of the umbrella shaft perfectly. These allow me to easily clip and un-clip the umbrella from my pack. I can also take my pack off and put it back on while leaving the umbrella still attached. The second part of the method involves a piece of shock cord, a carabiner, and cord lock attached to the handle. 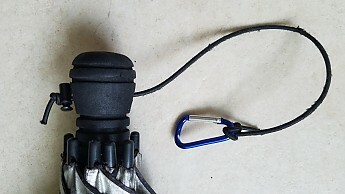 The carabiner can be hooked to various points (most commonly my chest strap), depending on how I want to manipulate the umbrella’s angle and height. If it’s gusty, I’ll sometimes wrap the cord around the shaft and my shoulder strap several times for better stability, before hooking it to my chest strap. The cord lock can further be used to adjust the tension. Conditions on the trail change constantly (up/down/level, open and protected, wind blowing all points of 360 degrees, all within 1 minute), and this little bit of shock cord provides a lot of adjustability. Mounting the umbrella on a pack doesn’t always work with the given conditions. When the sun is angled low and the trail is constantly changing directions (switchbacks), I find that I need to hold it in hand to get any effect. Also, if the wind is too squirrely, it is best to maintain better control of it in your hand. Lastly, because it can reduce your field of vision, it may be better to hold it. This isn’t usually a problem on flat or downhill tread, but can be really noticeable going uphill. One time I smacked my head into a tree limb that was hanging halfway out over the trail because I just didn’t see it (this could happen from wearing a rain jacket hood low over your head, too). More than any other piece of gear, people are absolutely intrigued by my umbrella being attached to my pack. Or maybe it’s just the umbrella. Some will poke fun and others will just stare longingly while standing drenched in the rain. Regardless, I enjoy extolling the benefits of a hiking umbrella and am unashamed of my gear choices. 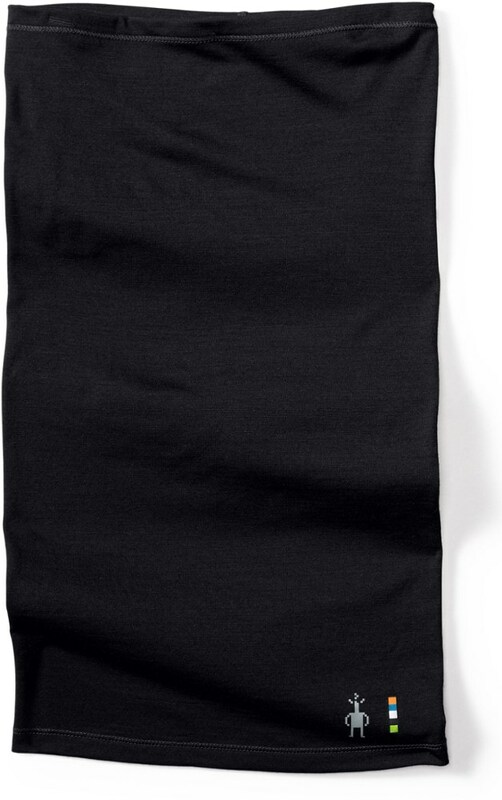 A privacy screen for potty breaks or changing clothes…really great for women! A weapon to ward off aggressive life forms…when open, it certainly scares the heck out of most horses, cattle, and sheep! 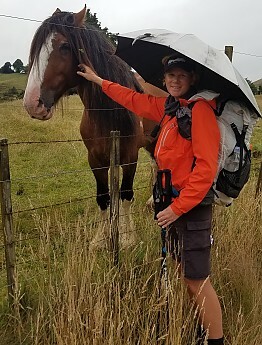 This is the only horse that has not been deathly terrified of my umbrella...he still doesn't look happy about it. As a sail while kayaking down a river…yes, I tried it and it worked! Summary: I have been exceedingly happy with my Liteflex umbrella. It has turned so many potentially bad days of walking in the rain into days that I still enjoyed being on the trail. Likewise, it has made insufferably hot and sunny days bearable. I have constantly mused that if I didn’t have it, I don’t know if I could have kept going. It has earned a place forever in my pack. Great review, Twig! Did you do the entire Te Araroa? Is the "Swing Trek Liteflex handsfree" umbrella the same as the "Swing Liteflex" from Euroschirm? Or, is there something different about the Swing Trek Liteflex and the Swing Liteflex? 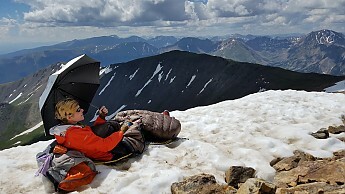 This trekking umbrella is a great multi-use piece of gear. 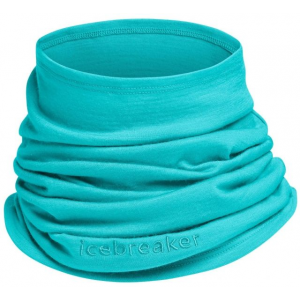 It is ultra lightweight and offers protection from sun and rain, keeps you cooler, you can use it hands-free, and it does much more. 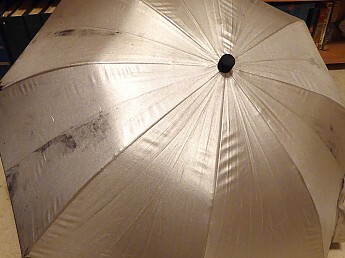 This is a review of the silver reflective-coated Swing Trek Liteflex Trek umbrella. I am not connected to the maker of this umbrella in any way. I got it on a good sale from Amazon, it typically retails for $40-$45. This umbrella has been licensed and marketed through a lot of different channels, so this umbrella and all of the following are the exact same thing: the EuroSCHIRM, the old GoLite Chrome Dome, and what is now sold by Gossamer Gear, Zpacks, and Six Moon Designs. You’ve probably scoffed at the idea of a backpacking umbrella, I used to as well. But then I began to see the wisdom of it. Form follows function, and whatever it may look like, this umbrella delivers a lot of functionality. It’s now my favorite piece of gear. 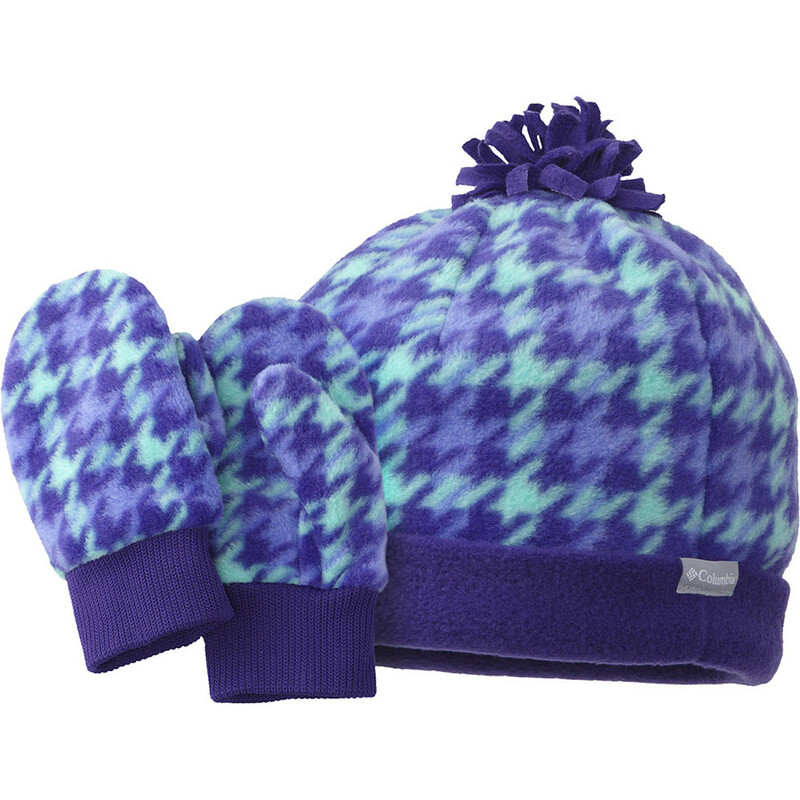 It serves as excellent sun gear and also excellent rain gear, and it has other uses as well. And, I can strap it hands-free to my pack and use it all day without holding it. This umbrella is super light, 7.9 oz on my scale without the carry case that comes with it. It features fiberglass shaft and ribs, EVA foam handle, and a Teflon-coated canopy. The canopy is 39.5" in diameter, a good size for protecting you. The umbrella height is 25.2". There is a wrist strap attached to the handle, I have thought about cutting it off but hesitate because it is molded into the foam handle (it’s not a hole through the handle that could take a replacement cord). Cutting that off probably would save half an ounce. The silver model has a reflective silver coating applied to the outside of the canopy fabric, and the canopy is black on the underside to absorb sun and heat reflected up from below. There are different colors available, but believe me you want the reflective silver coating. 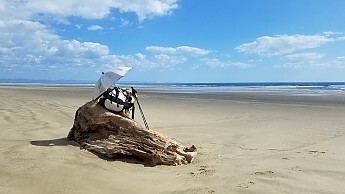 As a percentage of time used for each function, I use the umbrella more for sun and heat protection than anything else. And that’s really what an umbrella is designed for—after all, the root of the word umbrella is Latin for shade. The umbrella blocks the sun and keeps me cooler, but then the reflective coating maximizes and amplifies that effect by reflecting even more energy away. It protects from harmful UV rays and is rated SPF 50+. 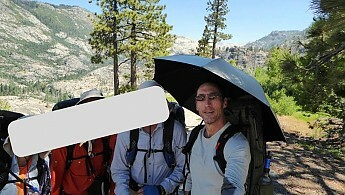 And…because of the tremendous shade that the umbrella provides, I usually don’t even wear a hat, even on totally exposed terrain at high altitude. This allows the breezes to flow across my entire scalp. I am a head sweater, and any hat no matter how light and ventilated makes my head hot and the sweat pours down. With this umbrella, though, I can feel a clear difference in temperature, my head stays cool, and I drip less sweat. Of course, the umbrella also works extremely well as rain gear. Instead of just covering your body like a rain jacket and hood, an umbrella is like a small “shelter” with a usable area underneath, keeping rain well away from your face and upper body so your face stays dry. As someone who wears eyeglasses all the time I especially appreciate not having my lenses covered in droplets. I can take photos from a dry vantage point. I can pull things out of my pockets or hip belt (notebook, map, first aid, etc) in a little dry bubble. Note: in the rain you want to make sure that the back of the umbrella goes over the top of your pack, not tucked between the pack and your body to avoid channeling rain down your back. Since it covers my upper body so well I don’t need anything more than a windshirt for all but the heaviest and most wind-blown rain, saving weight on rain gear. I can supplement it with a simple 2 oz rain kilt I made from a piece of silnylon and drawcord. This way I don’t get that clammy moisture build-up from my own sweat that happens when wearing a waterproof layer. I rarely need more than a windshirt in the rain underneath the umbrella. This umbrella is surprisingly strong and durable. The fiberglass frame is very sturdy despite being very light. This past summer I was crossing the Evelyn plateau in Yosemite high country, a notoriously windy place, and caught some gusts that I estimate at over 40mph – the umbrella flipped inside out but didn’t break (the ribs are designed to flip inside out), I popped it back to its proper shape and it’s as good as new. I also have brushed and scraped the canopy against pointy branches, bark on tree trunks and granite rock and nothing punctured the canopy, instead the fabric flexed and slid off the offending object very easily. Attaching the umbrella to your pack for hands-free use is simple. There are a variety of methods described on multiple websites (and easily found with a google search), here’s what I do: I used a larkshead to attach a couple of short segments of cord to the daisy chain loops on my shoulder straps (2 attachment points on each side), with a cord lock on each. To attach I just slip the umbrella handle down through the top loop and then the bottom loop on whichever side I choose, I cinch the bottom loop tight around the umbrella's handle (which conveniently has some grooves dye-cut into the foam, giving the cord a channel to stay in place) and then cinch the top loop around the umbrella shaft. It works really well. I can mount it either side, or if the sun is low on the horizon I can attach it diagonally across my chest to angle it how I want. This method holds solid all day without needing any adjustment, I'm totally hands-free (I use two trekking poles). I can even take my pack off and put it back on with the umbrella still attached. 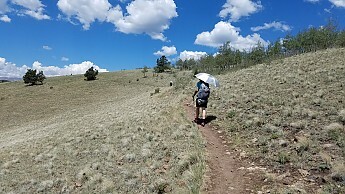 Walking around with a silver umbrella strapped hands-free to your shoulder strap is intriguing to people—those I meet on the trail always comment. In the backcountry they are more likely to appreciate the benefits of the hands-free setup. 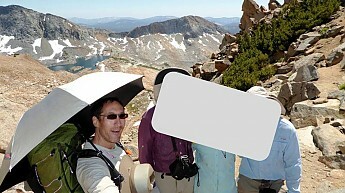 A trail crew in the Sierra Nevada wanted to stop me and ask all about it, they were highly interested. More toward the frontcountry I’m more likely to hear ignorant remarks from day hikers (“why do you need an umbella when it isn’t raining?”, or even “hey, do you get HBO on that thing?” hardee har har – you laugh, I’ll stay cool). Set it up as a wind break for cooking. It makes a great privacy screen for potty breaks. It’s a great little mini-shelter from the sun for your face if you want to stretch out and take a nap. In a rainstorm, combine the trunk of a large tree to protect you on one side with the umbrella protecting another side and you’ve got an effective mini rain shelter. The umbrella also can supplement a full shelter—for example, my shelter has a beak in the front that does not come all the way to the ground, that area usually is protected but wind-driven rain can get underneath it; I can put the umbrella in that gap to block wind and rain. 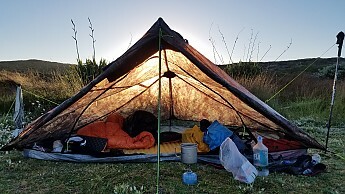 I can also use the closed umbrella as a short support pole for staking out some extra headroom in my shelter. I keep finding uses for it! There are some potential tradeoffs or downsides to mounting the umbrella to your shoulder strap. It cuts down on your field of view, upward in particular. 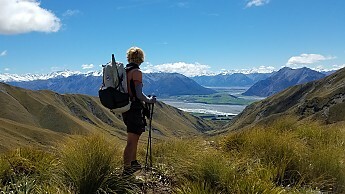 For level terrain and downhills it isn't a big deal, most of what the umbrella is blocking is sky and treetops, but when going up a steep incline the terrain ahead is “up” in your field of view, and you may be leaned over a bit to hold your pack’s weight on your back, so some of your view ahead can be blocked. Keep in mind a hat blocks your upward view to some extent as well, with the umbrella I feel I generally have a pretty wide-open view. People’s bodies tend to curve or have an angle from chest to shoulder. Thus, a shoulder-strap-mounted umbrella would follow that angle and could end up tilted back pretty far and therefore not covering your face as well. If you try to compensate by lowering the umbrella so it is on a more “vertical” part of your shoulder strap, yes you might get a more vertical angle, but being lower it will cut down even more on your view. I've been experimenting with a way to prop the umbrella forward at the top loop. Since the mounted umbrella could be tilted towards the back it may not do a great job of blocking the sun when it’s straight ahead of you. This is another time I put the TS cap on, no biggie. The umbrella and the top of your pack could crowd each other behind your head if your pack is tall and/or has big stuff strapped to the top. 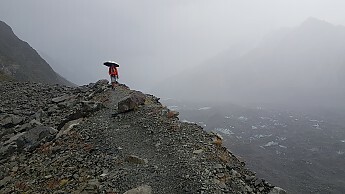 It isn’t easy to detach and remove and store the umbrella when you’re on the move, so it can be a pain to deal with when you go into an area with low branches, high shrubs, narrow rock passages, etc. If it's just a short passage I try to leave the umbrella attached and just collapse the umbrella's canopy around my head until clear. Ducking under branches or fallen trees with the umbrella attached is challenging, that's a time to detach and store it on the side of your pack. A strong gust of wind can catch the umbrella, and if it’s strapped strongly to your pack (and your pack is strapped strongly to you) then it can pull you off balance if you’re not careful. There also are a couple of small items to note in the potential “minus” column beyond the tradeoffs associated with attaching it hands-free. The shaft does not collapse, so this umbrella can’t pack any smaller than its full height of 25.2". I don’t find this to be a problem, if I’m not using it I can easily store it in a side pocket of my pack using the lash straps to hold it (same as carrying trekking poles on the side of your pack), but some people are bothered by the fact that the shaft doesn’t collapse to a smaller size (if it did it would come at the expense of the strength it offers). The silver coating on the canopy fabric scratches off pretty easily. My umbrella has what look like a few dark splotches or lines on it, which is where the silver coating was scratched off by some sort of abrasion. Even with what I've experienced I still have 99+% of the silver coating. The umbrella can be scary to wildlife. If you see a deer or a marmot near an established trail it’s probably pretty used to seeing humans and tolerates us from a distance, but then here comes some other creature on two legs with a giant reflective head—what the $%*#, I’m outta here. This actually could be a benefit if it helps scare off an overly-curious bear or mountain lion. 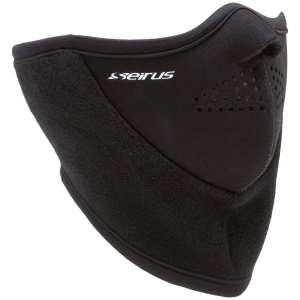 These are all minor quibbles, however, compared to the benefits you gain of walking around all day with your own personal cooling system, sun shield, and large rain-protected area following you around everywhere. If you aren’t sure if you would like a trekking umbrella you certainly can give it a try with any “everyday” umbrella from Walmart or Walgreens or Amazon or wherever—any umbrella can deliver much of the same benefits as the Swing Trek Liteflex. But, you won’t optimize your performance because an “everyday” umbrella will have a smaller canopy, will be heavier, won’t be as strong, and/or won’t do as good a job at reflecting heat away from you. 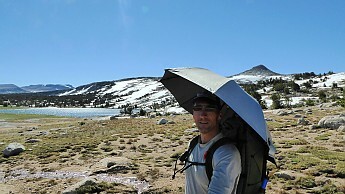 So for dedicated backcountry trekking use, nothing is more effective than the Swing Trek Liteflex umbrella. Cool and hands-free (I'm taking these pictures too). 1) Evelyn plateau, Yosemite. 2) Red Peak Pass, Yosemite. 3) Cherry Creek Canyon, Stanislaus NF. Thanks for the review, JR. I can see the value of this in open areas like your pictures show. Many of the trails I hike would have too much overhang to deal with. Good review! Yeah, I don't use it much on the AT or trails in north Ga or NC, but out west it gets lots of use. Thanks for the review, JR! Thanks Denis, and as I said in the review, nothing wrong with using an "everyday" umbrella for a test run or two just to see if you like how it works. you nailed just about every relevant point...great review! And yes, you can remove the wrist strap out. I did so with mine, replacing it with shock cord and biner that I can use to better secure the brella to my pack. The hole through the foam is still sturdy enough. Another few uses, you can write messages with a wax pencil on it ('need ride to town') and use it as a stick to prop up the sides of your tent. I love mine. Great review JR! I wonder if you could use this paddling? Like Goose I walk through heavy tree cover and an umbrella would be ripped to shreds crawling over/under/through blow-downs...but when paddling I am always looking for additional protection from the sun. I think most would be surprised by how much you can get away with using the umbrella on 'overgrown' trails. So far I've used mine on the AT, Florida Trail, and the Colorado Trail. The FT is by far the most overgrown but even here, I only occasional have to fold it down. Like JR mentioned, one can quickly fold it to get past an obstruction, then pop it back open, without ever having to remove it from a pack-rigged set-up. I will say that mine has suffered a lot of scuffing from the many encounters I have had with trees/bush in Florida, but it's still holding up fine. Don't be afraid to use it just about anywhere! Thanks guys. Lah, I'm curious about removing the wrist strap -- when I pull on my wrist strap it doesn't move through the handle, in other words it does not seem to be threaded through a hole all the way through the handle but instead seems molded into the handle itself. 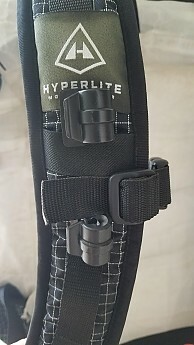 So when you cut yours off there *is* a hole all the way through the handle that you could replace the wrist strap with something lighter, is that what you're saying? I think the strap is glued into the handle. I had to work at getting it out using something to poke it through, I don't recall exactly what. Then there was a hole left that I could just squeeze some shock cord through. Unless they have changed the design, this should work. 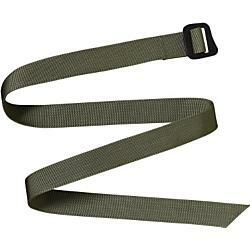 worst case, you destroy the strap, but do you ever use it anyway? 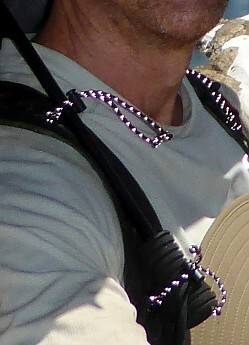 I use the shock cord to wrap around a shoulder strap or hip belt, depending on the angle of the sun or degree of rain. They work well, golfers use them all the time. Amazing how it actually is cooler underneath. These umbrellas actually keep you much cooler. It blocks the direct sun rays off you, thus cooler. As I said above, golfers use these same products all the time with great success. So if you are out in direct sun and you don't mind extra gear it's perfect. Go for it. Thanks for the review, Roger. 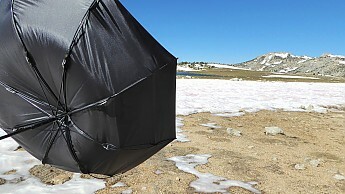 The Swing Trek Liteflex Umbrella is not available from the stores we monitor.